Wu Bangguo, ethnic Han, native of Feidong, Anhui Province, born in July 1941. Joined the CPC in April 1964 and began working in September 1966. Graduated from the Department of Radio and Electronics of Tsinghua University, majoring in electronic vacuum devices. With a university education. Engineer. Member of the Standing Committee of the Political Bureau of the CPC Central Committee, chairman of the Standing Committee of the Tenth National People's Congress and secretary of its Leading Party Members' Group. 1960-1967: Student of electronic vacuum devices at the Department of Radio and Electronics, Tsinghua University. 1967-1976: Worker and technician of Shanghai No. 3 Electronic Tube Factory, deputy chief and chief of its technical section. 1976-1978: Deputy secretary of the Party committee, deputy director of the Revolutionary Committee, deputy factory director, deputy secretary of the Party Committee and factory director of Shanghai No. 3 Electronic Tube Factory. 1978-1979: Deputy manager of Shanghai Electronic Components Company. 1979-1981: Deputy manager of Shanghai Electronic Vacuum Devices Company. 1981-1983: Deputy secretary of the Party committee of Shanghai Meters and Telecommunications Bureau. 1983-1985: Member of the Standing Committee of the CPC Shanghai Municipal Committee and concurrently secretary of the CPC Municipal Committee in charge of science and technology. 1985-1991: Deputy secretary of the CPC Shanghai Municipal Committee. 1991-1992: Secretary of the CPC Shanghai Municipal Committee. 1992-1994: Member of the Political Bureau of the CPC Central Committee, and secretary of the CPC Shanghai Municipal Committee. 1994-1995: Member of the Political Bureau of the CPC Central Committee and member of the Secretariat of the CPC Central Committee. 1995-1997: Member of the Political Bureau of the CPC Central Committee, member of the Secretariat of the CPC Central Committee, and vice premier of the State Council. 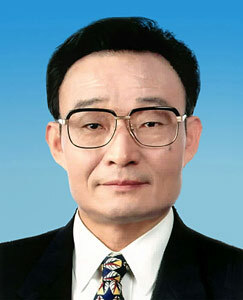 1997-1998: Member of the Political Bureau of the CPC Central Committee and vice premier of the State Council. 1998-1999: Member of the Political Bureau of the CPC Central Committee, vice premier of the State Council, and secretary of the Central Large Enterprises Work Committee. 1999-2002: Member of the Political Bureau of the CPC Central Committee, vice premier of the State Council, member of its Leading Party Members' Group, and secretary of the Central Large Enterprises Work Committee. 2002-2003: Member of the Standing Committee of the Political Bureau of the CPC Central Committee, vice premier of the State Council, member of its Leading Party Members' Group, and secretary of the Central Large Enterprises Work Committee. 2003- Member of the Standing Committee of the Political Bureau of the CPC Central Committee, chairman of the Standing Committee of the Tenth National People's Congress and secretary of its Leading Party Members' Group. Alternate member of the Twelfth and Thirteenth CPC Central Committees. Member of the Fourteenth through Seventeenth CPC Central Committees. Member of the Political Bureau of the Fourteenth CPC Central Committee. Co-opted as member of the Secretariat of the CPC Central Committee at the Fourth Plenary Session of the Fourteenth CPC Central Committee. Member of the Political Bureau of the Fifteenth CPC Central Committee. Member of the Political Bureaus of the Sixteenth and Seventeenth CPC Central Committees and member of their standing committees. Chairman of the Standing Committee of the Tenth National People's Congress.